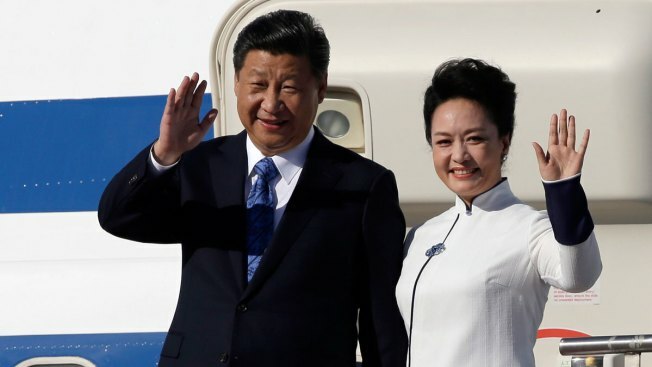 Chinese President Xi Jinping, left, and his wife Peng Liyuan wave upon arrival Tuesday, Sept. 22, 2015, at Boeing Field in Everett, Wash. Xi is spending three days in Seattle before traveling to Washington, D.C., for a White House state dinner on Friday. When Chinese President Xi Jinping addresses a meeting of some of the top names in Chinese and American business Wednesday, they may be most interested what he says about progress toward a treaty between the nations that would provide a framework for broader investment in each other's economy. Apple Chief Executive Tim Cook, Microsoft's Satya Nadella, Amazon's Jeff Bezos, investor Warren Buffett and Jack Ma of Chinese e-commerce giant Alibaba are among the 30 top executives attending a closed-door discussion being moderated by former U.S. Treasury Secretary Henry Paulson, who has advocated for such a treaty. All of the American CEOs participating signed a letter to Xi and U.S. President Barack Obama urging them to support an agreement. Bilateral investment treaties provide the rules of the road for companies doing business in other countries, and can help ensure that the rights of foreign investors are protected and that foreign companies operate on a level playing field with domestic ones. An agreement with China would open up more of that nation's massive market to American companies, provide clearer rules for Chinese investment in the U.S., and create jobs on both sides, supporters say. Such treaties "can be a powerful catalyst for more economic growth," Evan Feigenbaum, vice chairman of the Paulson Institute, which is co-hosting Wednesday's meeting, said Tuesday. Xi arrived in Seattle Tuesday for a three-day visit before he travels to the White House later this week. He's expected to make brief remarks to the attendees before the session closes to the press. Notable absences at Wednesday's business discussion were representatives from Twitter, Facebook and Google. Those companies' websites are blocked in China. At his policy speech Tuesday evening — attended by dignitaries like former U.S. Secretary of State Henry Kissinger, former U.S. Treasury Secretary Hank Paulson and Penny Pritzker, Obama's commerce secretary — Xi said China and the United States could work together to address cybercrimes, a problem that has sparked mutual tension. Acknowledging that China and the United States don't always see eye to eye, Xi said China is ready to set up a joint effort with the United States to fight cybercrimes. As Xi spoke Tuesday evening, protesters gathered near the downtown hotel he was staying at, objecting to things like the country's policies in Tibet. Xi's visit comes a year after Xi and Obama announced their nations would cooperate to fight climate change.